Summer 2016 was amazing! Food For Thought Teen Program visited the African-American Historical Corridor, Tift Farm, Continental School of Beauty, Erie Community College North Campus, Buffalo State College, Beaver Island State Park, Community Gardens, The Public Library and so much more. We have entertained guests from the Broadcasting and Communications field, Design Artists, Culinary Artists, Stylists, Motivational Speakers and a diverse brand of community leaders and entrepreneurs. FFT looks forward to you (your teen) joining us this fall, beginning on Thursday September 29, 2016. This season we have many activities planned and many more awaiting your input, into our activities and guests. Background on Food For Thought: Gloria J. Parks Community Center has implemented a teen after school program in the summer of 2015 to foster personal growth, resilience, and educational success in inner city girls aged 14 to 18 in Buffalo. Food For Thought has evolved to include girls as young as 12 and activities that include physical fitness! A character development workshop led by experts from our community on topics chosen by the girls. Our teens will cook homemade, nutritious meals, to internalize wellness habits and prevent obesity. The girls will eat and socialize with guest experts to develop trust and social skills with adults outside of their families. During the character development workshops, guest experts will lead experiential, interactive activities exploring subjects like self-esteem, positive relationships, health, and college and career preparation. For more information or for an application please call at 716.832.1010 x 202 or come into Gloria J. Parks located at 3242 Main Street, Buffalo, NY 14214! Above is the link to our Food for Thought Application. Applications must be completed and signed by a parent/guardian to ensure program enrollment. Please share our program flyer with your community and help us get the word out! 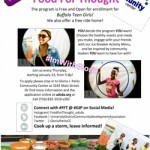 Check out Food For Thought featured on WBLK’s Buffalo Alive!